During holiday weeks I have a hard time wrapping my head around dinner. There's just so much going on. Pasta is a no-brainer, but my kids are totally bored with the usual red-sauce routine. 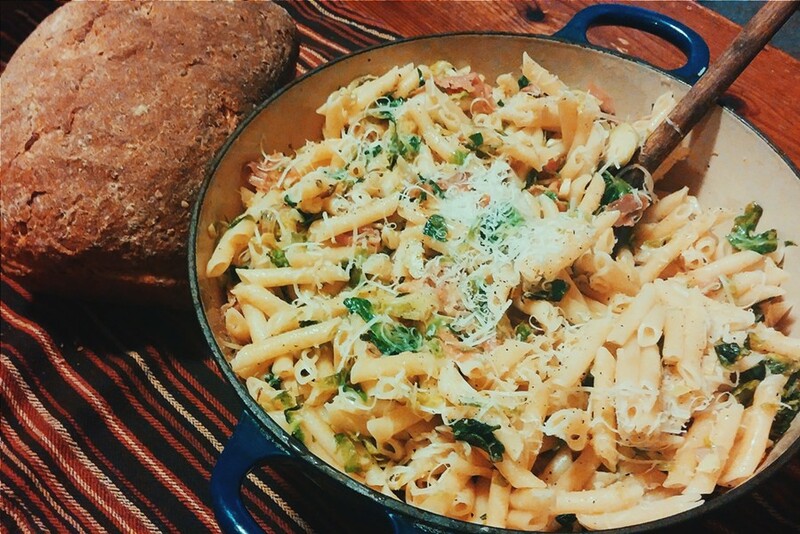 So I'm always thinking of new combinations that will make a bowl of penne new and exciting. My latest creation is this dish. Originally, I whipped it up with the last few contents of our refrigerator after a particularly busy week. It requires a few pans but not much time, so you can manage it even if you're diving into Thanksgiving prep work like me. The best part? It's so tasty that your kids will eat brussels sprouts! And brussels sprouts are so healthy they cancel out the bacon, right? Either way, I'm making it tonight. 1-1½ pounds penne (or your favorite pasta shape) I usually make 1½ lbs for my family of 5 since we like to have some leftovers. 3 cups thinly sliced brussels sprouts. Slice off the hard bottom bit to make a flat surface, then slice like an onion! Cook and drain the pasta and set aside. Heat the olive oil in a large skillet over medium heat. When it's nice and hot, add the onions or shallots and sauté for a few minutes until fragrant. Add the brussels sprouts and sauté until they look bright green and shiny, about 5 minutes. You still want them to have a bit of crunch. Add the garlic last, and sauté for just a minute or two more. Put the pasta in a large serving bowl. Add the cooked veggies and the parmesan cheese and toss well to combine. Add the bacon and toss gently. Taste and season with salt and pepper. Finish with a drizzle of olive oil and another sprinkling of parmesan.